Waringstown will welcome back Kyle McCallan to their squad for what is a massive weekend for the club. The Villagers host CIYMS in a Twenty20 Cup semi-final on Friday night, before a league fixture against Armagh on Saturday and an Irish Senior Cup quarter-final against Pembroke on Sunday. McCallan has missed the last few games through a school rugby tour to Canada, and captain Greg Thompson says it is a major boost to have the all-rounder back in their ranks. “It’s important to have someone of Kyle’s ability and quality back in,” he said. “It’s a boost to the changing room. It was a big win to get across the line against CIYMS without him. “It isn’t just his experience and his guaranteed 10 overs, but to have him coming in at number eight to steer us across the line in tight ones, he is usually invaluable. 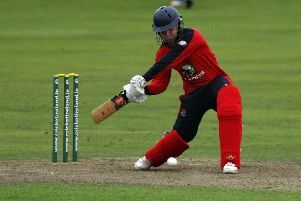 Batsman James McCollum comes into the weekend in fine form having struck 170 for the Ireland Wolves against Scotland ‘A’ on Tuesday. The 22-year-old also hit a century for the Northern Knights earlier this season, along with scores of 87 and 84, and Thompson is hoping he can continue to excel in the big games. “He has had a fantastic season at representative level. “He has two 80’s and a hundred in three day cricket, and has backed it up with 170 for the Wolves which is fantastic. I watched the highlights and he’s hitting the ball cleaner than I’ve ever seen him hit it. “He will know that himself and he will want to translate that into league cricket now, which he hasn’t done this season yet. “The good thing is that there are plenty of big games, and James is one of our many big game players who when it comes to it, knows when to deliver. 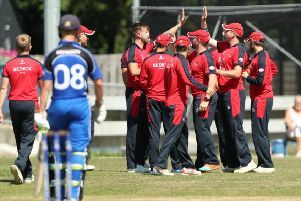 Waringstown are defending champions in all three competitions they play in over the next three days, and Thompson says the key to adjusting to different formats is that every single player knows, and enjoys, their role within the team. “The basics of cricket are always the same in the sense of see ball, hit ball, bowl straight and catch what you can. “The small details do change, but we are into our third or fourth year as a team and everyone knows their roles in the different formats, whether that’s Twenty20, white ball cup cricket or red ball league cricket. “Everybody is very comfortable with their roles and the guys are used to delivering in their roles now. Competing at the very highest level can bring its own pressures, and trying to win and retain every trophy available is an incredibly difficult task. Thompson says his side aren’t concerned about whatever pressure there may be, and instead focus on each game as it comes. “I don’t think our boys give it too much thought. Generally, the boys will train hard during the week and then go out and try and win whatever game it is. “Whether we are champions or not, the guys just want to win games of cricket and that’s the biggest focus.